Structures at the left edge of the cytopharynx arise in contact with the filamentous reticulum that lies next to the alveoli to the side of the quadrulus. The cytopharyngeal ribbons coming out of the filamentous reticulum have a spacing that seems to be determined by the lattice-like arrangement of this reticulum. A microtubular ribbon arises against each electron-opaque row of nodes of the reticulum. A cytostomal cord borders the cytosolic ends of these ribbons along the entire length of the left side of the cytopharynx. The ribbons curve sharply over the cord and pass out into the endoplasm. Three types of vesicles are transported along these ribbons, discoidal vesicles, large acidosomes and small 100nm carrier vesicles. They all move along the ribbons from the endoplasm toward the cytopharynx and the cytostomal cord toward the origins of the microtubules. Discoidal vesicles reach the cytopharyngeal membrane under the cord where they fuse. 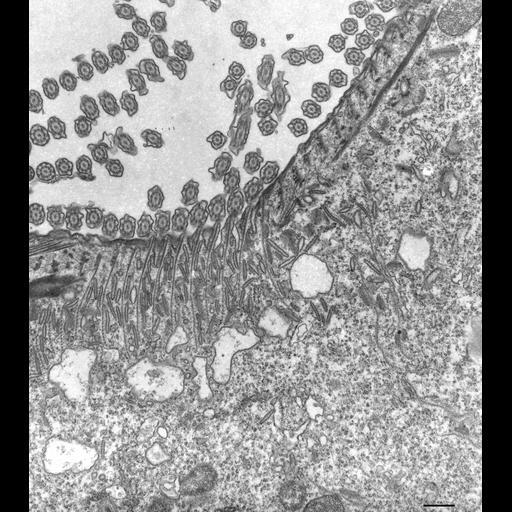 Acidosomes are too large to pass under the cord and the 100nm carrier vesicles appear to have an affinity for the acidosomes and fuse with these large vesicles before reaching the cytopharyngeal membrane. TEM taken on 3/28/80 by R. Allen with Hitachi HU11A operating at 75kV. Neg. 8,500X. Bar = 0.5µm.